Finally in First: 800 Followers GIVEAWAY! I reached 800 followers today! So of course that means...GIVEAWAY time! I will give a lucky winner any item they choose from my TPT store. Will it be my newest 3-game set? or did you have one of my other items on your wishlist? 2. Become a follower of my TPT store. 6. Follow my blog if you don't already. 7. Put me on your sidebar. 8. Grab my blog button. I will pick the winner on Saturday so enter NOW! Also, don't forget that today is the last day to vote in the Really Good Blog Contest! If you would like to vote for me you can click on the image in the top right of my sidebar. I grabbed your button also! I like your TPT store! 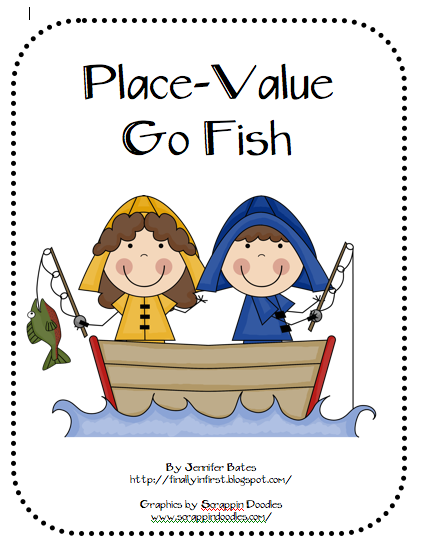 I follow your TPT store and would LOVE to win the Place Value Go Fish. Students seem to have trouble with that! I am following you on TPT and I love your new skip counting games! I "liked" you on FB awhile back! I am already following your blog as well! I'd like Place Value Go Fish! I would probably get your Counting Cows set! I love the Sweet Shop Coin Game AND Puppy Patterns. So cute! I would like your coin counting game from your store. I would love to win your counting cows game! I liked you on Facebook and left a comment on your wall! Your blog is advertised in my sidebar! I would definitely like to have your newest 3-game set, Counting Cows! So cute! I would soooooo love to have "Counting Cows!" Too cute! I would LOVE to have Counting Cows!! I would choose your Place Value Go Fish. 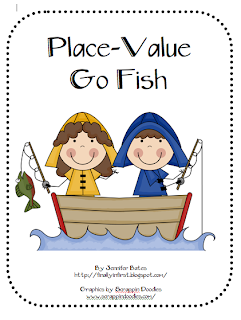 I would love your "Place Value Fish" game for my classroom. It is so adorable and I know my students would love it!!! Your are on the sidebar of my blog. I blogged about your giveaway. Congrats on 800 followers! I would love to win your Counting Cows pack. So cute!!! Thanks for the giveaway! I am already a follower of your TpT store! Great resources! I am also already following your blog! 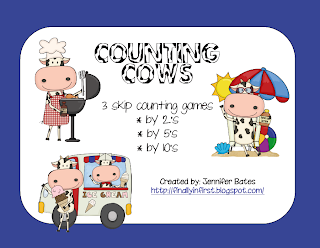 I love your Counting Cows Games! I am a follower of your TPT ...great stuff! I already have your button on my blog page!! I like your Freckle Juice packet on TPT. I will be teaching 3rd grade this year and plan on reading this with my class. I follow your on TPT. I would love the place value gold fish. Your blog is on my sidebar too! Hi Jenn! I really hope I win the Place Value Go Fish game! 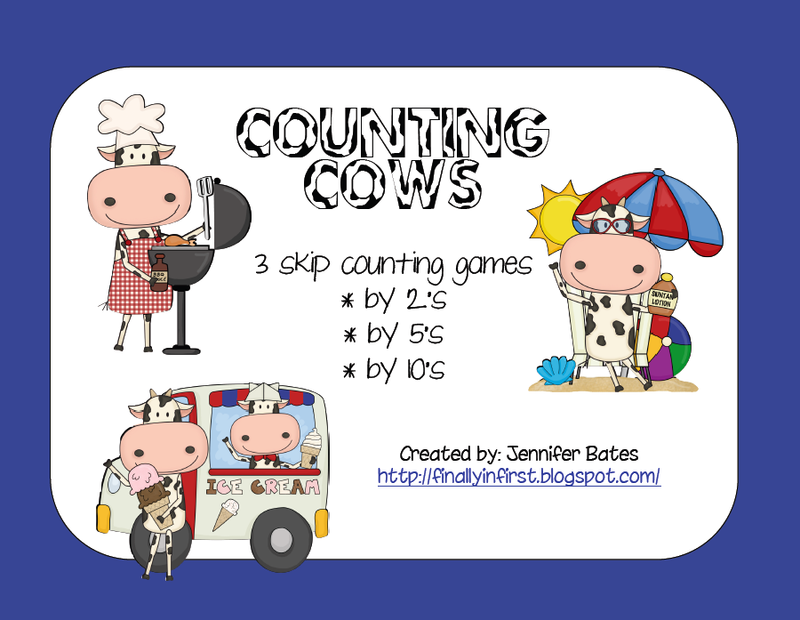 I would love to win your new "Counting Cows" game from your TpT store! I love the skip-counting cows game! I have been following you on your TpT store!! I subscribed to your blog by email about a week ago ... LOVE getting the updates ... so addicting!!! Thanks for all that you share!! I now "like" you on Facebook too!! I have shared your blog with at least 10 teacher friends who have all started following your blog and TpT store now too! We ALL love your stuff so much!!! I'm a long time follower of your blog! If I won, I'd love your Counting Cows game. I want to win the cow game because I love cows and math. I think I'd like the counting cows game. I would get the Bowling 10 frame. We use 10 frames all the time. I would love to win your Place Value Go-Fish game! I would love to win your Counting Cows game! Soo cute! I follow you on TpT, too! I would love to get your 3 skip counting games! They would be so helpful with my first graders. I am already a follower of your FANTASTIC blog! I just checked out your tpt store--I love so many of your number games. I think I like either your bowling ten frames game or your puppy spacial dots game the best! And, I now have your tpt store on my list of favorites to follow!